I am not a morning person; however, due to the ungodly hour at which Eric's alarm clock rings every morning, my sleeping habits have slowly evolved over time. During my teens and twenties, fourteen hours of uninterrupted sleep on weekends was normal. In contrast, on my days off now, you will rarely find me in bed after 8 am. One of the benefits of waking up earlier is time to make and enjoy a civilized breakfast before rushing off to complete a page long To Do List. 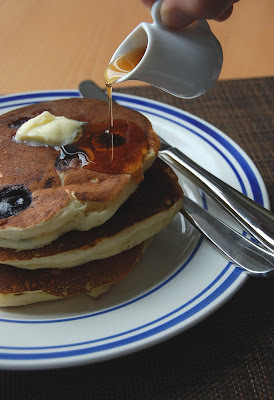 This Sunday, I used up some leftover buttermilk by making blueberry pancakes, served with an old family friend, Aunt Jemima. I have been losing sleep for another reason. We have a house guest of the feline variety who likes to scratch on our bedroom door nightly. Simba is my sister's cat of nine years who, sadly, can no longer live with them because of allergies. Even though Aunt Charmaine is also allergic to cats, my attachment to Simba is so strong that we are considering feline adoption. During this short trial visit, I am weighing my itchiness and dislike of sticky fur against her gentle presence and undefinable bewitching qualities. I am so torn. Soon, I will be jetlagged (or not, if melatonin can help it) because we are traveling to Europe again. In particular, we are returning briefly to Paris so I can attend Europain 2008, a large international trade show for baking, pastry, chocolate, and ice cream, before heading off to Italy. I love Parisian pastries but dare I say, I am looking forward to Italian cuisine even more! Posted by Charmaine at 1:43 p.m. I came here after you left a comment in my blog and what a beautiful surprise! Your photos are stunning and the cat cake...? Oh my! Gorgeous! I also changed careers from finishing getting a MBA and working in telecom to pastry (although my family has a pastry shop and I have always been around it), it was a very big career change for me. And soooo worth it! I'm glad you were able to follow your dream too. I will definitely keep coming back! March 28, 2008 at 12:27 p.m.
March 30, 2008 at 5:44 p.m.